The paintings in this exhibition are the product of an intense engagement with the material of paint itself and the continual attempt to visualise experience – that which is other to painting - that which comes from the artist. This could be described as the tension between abstraction and experience. These paintings embody the subjective experience of the artist - forces and sensations are embedded in the paintings themselves – channelled into the making process. Yet there are differences in these paintings: some have arrived at resolution prematurely, challenging the process of painting and any predetermination. All have been initiated by the use of the dark ground which acts as a fluid, immersive space at the outset of the painting. 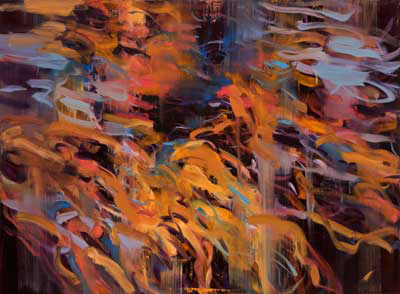 The wet-into-wet technique demands free-flowing gestures to emerge out of this dark ground: the immersive-emergent relationship creating depth and a type of three-dimensional space in the work. In retrospect, however we attempt to define the experience of making painting it is those inexplicable moments – the inexperience of painting - which has finally brought the work into being. Rebecca Meanley received an MA in Fine Art from Chelsea College of Art and Design, London, in 2003, having previously studied at Nottingham Trent University and Glasgow School of Art. Rebecca lives and works in London and exhibits internationally; she is also a part-time Lecturer in Fine Art and Visual Art Practice at the University of Bedfordshire. Her primary practice as a painter incorporates drawing and writing and uses photography as archive. In 2015 Meanley exhibited in Material Tension at the Collyer Bristow Gallery, London, curated by Day and Gluckman, Sunday in the Park with Ed curated by Cedric Christie and Pascal Roussen at the Display Gallery, London, A5 Art Athina, Athens with Lubomirov-Easton, Arte Mexico a British Art Auction in Mexico City, The Other Art Fair in London and Small Is Beautiful New York. 2014 shows include From Here & There at the Clara Hatton Gallery, Colorado USA which then toured to The Elysium Gallery in Swansea, Wales, Summer Salon at the Lion and Lamb, London which toured to The Lookout in Aldeburgh and Small is Beautiful at Flowers New York. Meanley undertook a residency in Hontianske Trstany, Slovakia, resulting in an exhibition there in September 2014. In 2013 Meanley’s work was selected for the Royal Academy Summer Exhibition by Humphrey Ocean. Her work is held in several private collections including that of Deborah Curtis and Gavin Turk.